According to tradition, there are 613 mitzvot (commandments) in the Torah. Some say the 613th is the commandment to write a sefer torah (Torah scroll), a commandment that most individuals never have the opportunity to fulfill. 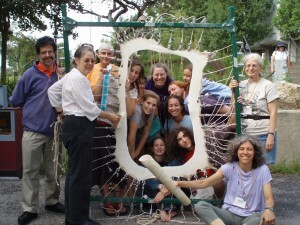 The Community Torah Project is a long term endeavor designed to open up this sacred process of creation, by providing volunteer individuals and groups the opportunity for hands-on participation in various steps in the process of making a Torah scroll. Participants in the Community Torah Project have included individuals and groups of all ages, from school children through senior citizens. 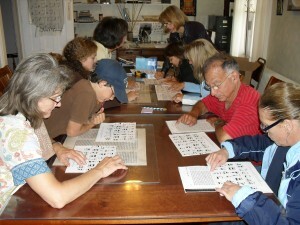 Volunteers have assisted in a variety of ways: collecting turkey feathers for quills, donating deerskins, helping with the fleshing, dehairing, scraping, stretching, sanding, cutting or scoring stages of parchment-making; assisting in the production of ink; proofreading completed panels of text; and stitching together proofread panels. Begun in 2007, the Torah scroll is over half written and has involved the participation of over 2800 volunteers to date. A charitable project, this Torah scroll will be donated to a community in need upon completion.